Have you ever watched people go through a buffet line? I have seen people pick food up, sniff it, and put it back in the serving dish. 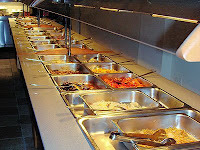 I have seen people sneeze and cough into the buffet. I have seen people talking and laughing, unaware that they've just sent a wad of spittle into the food. I have seen people "test" the food texture or temperature with their fingers. Nope. No buffet for me, thank you. Its amazing how aware you are of disgusting food like this as you get older. I get a sinking feeling every time I look at an energy drink nowadays. I feel like if I even drink one I'll get diabetes.